This article is about the musical genre. For the film, see El Mariachi. Mariachi (/mɑːriˈɑːtʃi/; Spanish: [maˈɾjatʃi]) is a style of music and musical group performance that dates back to at least the 18th century, evolving over time in the countryside of various regions of western Mexico. It has a distinctive instrumentation, musical genre, performance and singing styles, and clothing. From the 19th to 20th century, migrations from rural areas into Guadalajara, along with the Mexican government's cultural promotion gradually re-labeled it as Son style, with its alternative name of “mariachi” becoming used for the “urban” form. Modifications of the music include influences from other music such as polkas and waltzes, the addition of trumpets and the use of charro outfits by mariachi musicians. The musical style began to take on national prominence in the first half of the 20th century, with its promotion at presidential inaugurations and on the radio in the 1920s. In 2011 UNESCO recognized mariachi as an Intangible Cultural Heritage, joining six other entries on the Mexican list of that category. The origin of the word is disputed, but prominent theories attribute it to indigenous roots. One states that it comes from the name of the wood used to make the dance platform. 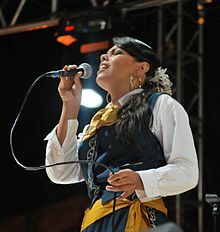 Another states that Mariachi comes from the indigenous name of a tree called pilla or cirimo; yet another states that it came from an image locally called María H (pronounced Mari-Ache). In many Mexican cultures they are also called Marietti. Mariachi can refer to the music, the group, or just one musician. The term "Mariachi band" is also a redundant term for a Mariachi because the word 'Mariachi' itself in Spanish implies a group of musicians playing Mariachi music. The word "mariachi" was thought to have derived from the French word "marriage", dating from the French intervention in Mexico in the 1860s, related to the music's appearance at weddings. This was a common explanation on record jackets and travel brochures. This theory was disproven with the appearance of documents that showed that the word existed before this invasion. Prior to the arrival of the Spanish, indigenous music was played with rattles, drums, flutes, and conch-shell horns as part of religious celebrations. The Spanish introduced violins, guitars, harps, brass instruments, and woodwinds, which mostly replaced the native instruments. The Europeans introduced their instruments to use during Mass, but they were quickly adapted to secular events. Indigenous and mestizo peoples learned to play and make these instruments, often giving them modified shapes and tunings. In addition to instruments, the Spanish introduced the concept of musical groups—which, in the colonial period, generally consisted of two violins, a harp, and various guitars. This grouping gave rise to a number of folk musical styles in Mexico. One of these folk musical styles was the son. This music featured string instruments. Son music divided into various regional varieties—the variety popular in the Jalisco area was called son jalisciense, whose best known song, also referred to as "the mariachi national anthem," is “La Negra.” Modern mariachi music developed from this son style, with “mariachi” as an alternative name for son jalisciense. Early mariachi players did not look like those of today; they played only string instruments such as guitars and harps and dressed in typical peasant clothing: white pants and shirts with huarache sandals. Those who could play the son jalisciense/mariachi music could find work at haciendas at a higher rate than those who could not. The distinction of mariachi from the older son jalisciense occurred slowly sometime during the 19th century. The music originated in the center-west of Mexico. Most claims for its origin lie in the state of Jalisco but neighboring states of Colima, Nayarit, and Michoacán have also claimed it. However, by the late 19th century, the music was firmly centered in Jalisco. 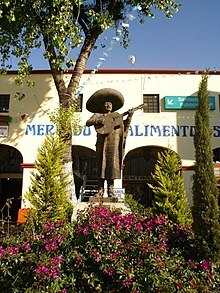 Most legends put the origin of the modern mariachi in the town of Cocula, Jalisco. The distinction from son to modern mariachi comes from the modification of the music. By the end of the nineteenth century, the European art music tradition was firmly transplanted to Mexico, with opera, salon music, waltzes, and more written and performed both by Europeans and Mexicans in the country. One variety was the salon orchestras called orquestas típicas that performed in more rural settings, notably in charro outfits. This use of the charro outfit was repeated with urban mariachi in the 1920s. The Charro outfit was also used in the national Orquestra Típica Mexicana (Mexican Typical Orchestra), organized in 1884 by Carlo Curti, and touring the United States and Mexico as part of a presentation of nationalism for the Mexican president Porfirio Diaz. Curti's Orquestra Típica Mexicana has been called the "predecessor of the Mariachi." After the Mexican Revolution, many haciendas had to let workers go, including mariachis. Groups began to wander and play for a fee, which obliged them to incorporate other music into their repertoires, including waltzes and polkas. It also required them to play in public venues. From the late 19th century to the 1930s, Mariachi groups were semi-professional. In the early 20th century, U.S., record companies began actively recording rural music in other parts of the world. One of these as a recording called Cuarteto Coculense by Columbia, Edison and Victor in 1908 and 1909, recognized as the “first” mariachi recordings. The music also gained attention in Mexico City when a wealthy hacienda family brought an early Mariachi from Cocula to play for President Porfirio Díaz in 1905. The common perception of the music and look of mariachi developed in the 20th century, as the music was transformed from a regional rural folk music to an urban phenomenon that came to represent Mexico. The music was first introduced to Mexico City in 1905. During this time, many farm workers moved to the city, including those from Jalisco, which settled around Plaza Garibaldi. These mariachi musicians developed new practices, such as performances in plazas and restaurants. However, it also continued its more traditional venues such as serenades, and performances at major family events. During this time, the Mexican government was heavily involved in cultural promotion as a way to create a unified Mexican identity after the end of the Mexican Revolution. One of these efforts was the promotion of mariachi as an international symbol of Mexican identity, first with radio and sound recordings and later with films. Mexico built a nationwide radio broadcasting network in the 1920s such as XEB and XEW, which began broadcasting mariachi music as a media production, rather than as a music for social events. This music was already being modified in part due to the advent of sound recording. For example, most son jaliscense songs were longer than the standard three-and-a-half minutes of the then-standard 78 rpm record, forcing the shortening of tunes. Around the same time, the popularity of jazz and Cuban music introduced the trumpet into mariachi, pushing the violins into second place and in some cases, replacing the harp. Mario Santiago and Silvestre Vargas in a musical presentation, 1958–1959. The most prized of the mariachis remained those from the state of Jalisco, particularly the areas of Cocula and Tecalitlán. They represented Mexico to the people during the Independence Day celebrations in Mexico City in 1933 as well as during Lázaro Cárdenas' election campaign in 1936. The charro tradition was strong in Jalisco, especially in a region called Los Altos. After the Revolution, the charreada became a national sport in Mexico and rings were constructed specifically for them, followed by professional charro associations. With the breakup of the large haciendas, charros were no longer economically necessary but were used as a cultural ideal, especially by the film industry in the mid-20th century. The first charro movies date from the 1920s, but the first to sing mariachi was Tito Guízar in Allá en el Rancho Grande in 1936. The character was played by Jorge Negrete in films such as ¡Ay, Jalisco... no te rajes! and ¡Así se quiere en Jalisco! The main characters used his ability to sing mariachi as a way to show strength, virility, and aesthetic beauty. Its use in film also made the music popular and a symbol of ethnic pride for Mexican Americans in the United States. Its use in film also promoted a negative perception of mariachi music. The films associated the charros and mariachi music with machismo, womanizing and drinking, especially of tequila. The reason that the movies did this was that mariachi music was associated with bars and the lower classes in a number of segments of Mexican society in the early 20th century. This would change in the latter half of the 20th century, but the music remains strongly associated with tequila. Mariachi music and musician became more professional with more formal training starting in the late 1940s and early 1950s, principally due to the success of a major Mariachi by the name of Mariachi Vargas. Their appearance in many films, backing many singing stars and their hiring of a formal musician prompted other mariachis to do the same. The group also expanded adding trumpets, violins and even a classical guitar to become a kind of orchestra, keeping the traditional son/mariachi base while integrating new musical ideas and styles. One other innovation, in contrast to the machismo of the style were the first female mariachi performers, Lola Beltrán and Lucha Villa. One night Mariachi Vargas put Beltrán on stage when she was a teenager. Her versions of “Cucurrucucu Paloma” and “Tres Dias” are now considered classics. Many of the traditional sounds of Cocula were lost as mariachi groups incorporated other musical styles that were popular on the radio. New influences have come into the tradition from the Mexican American community in the United States. In both countries, however, the learning of traditional pieces and repertory is still stressed to form a base. The International Mariachi Festival in Guadalajara is an annual ten-day event that attracts more than 500 mariachis, who perform in concert halls and city streets. Past players include Mariachi Vargas de Tecalitlán, Mariachi los Camperos (led by Nati Cano) and Mariachi América. In Mexico City, the center of mariachi music remains Garibaldi Plaza. The plaza fills with mariachi musicians to solicit gigs from individual songs for passers-by to being hired for events such as weddings and baptisms. They even stand on Eje Central in front of the plaza to flag down passing cars. In 2010, the government renovated the plaza to make it more tourist-friendly, adding new paving, gardens, police, security cameras, painted facades, and a museum dedicated to mariachi and tequila. Although mariachis can be hired in Mexico City over the phone or on the internet, many people still prefer to come to the plaza, hear the musicians and haggle over the price. About 2,500 mariachis hold union cards to work in the plaza, but as many as 4,000 may circulate through on a busy weekend. The size of a Mariachi group varies depending on the availability of musicians. The usual mariachi group today consists of as many as eight violins, two trumpets and at least one guitar. Traditional mariachi guitars include the vihuela, a high-pitched, round-backed guitar that provides rhythm, and a bass guitar called a guitarrón, which also provides rhythm. Sometimes a Mexican folk harp provides bass and ornaments the melody. All are Mexican variations of European instruments. There is generally no lead singer as in other kinds of group with all players singing choruses and taking turns singing the lead. Often the lead singer is assigned to a certain song due to voice qualities. Mariachi vocalization shows influences from a number of styles such as bolero (a romantic style), huapango (using falsetto), son jalisciense (an aggressive style) and more. Voices must be strong to be heard over amplified instruments. Vocal style emphasizes operatic qualities and instrumental performance demonstrates a level of virtuosity that reflects advanced musical training. Historically, mariachi groups have been made up of men but there is growing acceptance of female mariachis. As mariachi groups are expected to play requests, they may need to know hundreds of different songs. Most songs are about machismo, love, betrayal, death, politics, revolutionary heroes and even animals and country life from the genre origins as rural son music. One particularly famous song is “La Cucaracha” (The Cockroach). Most mariachi groups are associated with family and religious celebrations along with serenades. One of the most common pieces played by Mariachis is “Las Mañanitas” for birthdays and celebrations of patron saints. In Mexico, mariachi music can also be found as part of Catholic Mass. The Misa panamericana is a mariachi folk mass sung in Spanish with new arrangements of classic hymns such as "Kyrie Eleison". This innovation began in 1966 by Canadian priest Jean Marc Leclerc and it moved from a small church to the Cuernavaca Cathedral. Silvestre Vargas (1901-1985), violins and musician of the Mariachi Vargas from 1921 to 1975, director from 1931 to 1955. Mariachi Vargas de Tecalitlán is recognized as the oldest and the best mariachi ensemble, founded by Gaspar Vargas in the late 1890s. They moved from Jalisco to Mexico City and performed for the inauguration of President Lázaro Cárdenas. Mariachi Vargas became famous accompanying singers such as Luis Miguel, Lola Beltrán, and Pedro Infante. Mariachi Vargas’s first recording was in 1937, the same year they appear in “Asi es mi Tierra”. They appeared in over 200 films in the 20th century. Silvestre Vargas took over Mariachi Vargas de Tecalitlán from his father in 1958 and soon after hired a trained musician, Ruben Fuentes, as musical director. 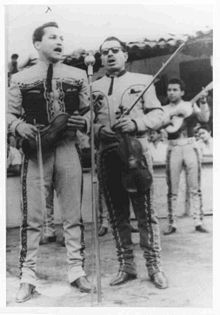 Fuentes along with Vargas were instrumental in the standardization of much of mariachi music, arranging traditional songs and writing new ones that would be performed by many of the legendary performers of the mid-20th century, such as Pedro Infante, Miguel Aceves Mejía, Lola Beltrán and José Alfredo Jiménez. Mariachi Vargas still remains, tracing its history in terms of generations, starting in the 1890s, with these generations maintaining the group’s authenticity as a Mariachi while the music has evolved. The last Vargas associated with the group died in 1985. That the group still considers itself the original group comes from the notion of passing on the music by generations of musicians, how the original son jaliscense was learned. The promotion of mariachi as representative of Mexico has led to the formation of mariachi groups in many countries such as Argentina, Aruba, Egypt, Chile, Cuba, Spain, Croatia, Guatemala, Uruguay, Sweden, Peru, Brazil, Colombia, Ecuador and Venezuela, with groups from these and more countries participating in Guadalajara’s International Mariachi and Charreria Conference. The music has a strong following in the US, with top groups spending a lot of time on tour. Mariachi Los Camperos received a Grammy nomination for best Mexican-American album. Academic programs allow for instruction by famous mariachi groups and the opportunity to win awards. The first mariachi groups in the United States were from California. Nati Cano was born in Jalisco in 1939 and moved to Los Angeles in 1959. He played in many Mariachi groups backing singers but felt mariachi could stand alone. In 1969 he opened a restaurant called La Fonda in Los Angeles, which featured his group, Los Camperos, as part of a dinner show. The success of this enterprise, and of Los Camperos in general have inspired many mariachi groups in the United States. In the late 1980s, pop star Linda Ronstadt recorded "Canciones de Mi Padre" and "Más Canciones" with Mariachi Vargas de Tecalitlán and others, which helped promote its popularity among Mexican Americans and to non-Mexican Americans. Some U.S. public schools offer mariachi as part of classes. The first student Mariachi group was begun in 1961 at the University of California, Los Angeles. This prompted the creation of other student organizations in other parts of California and then in Texas, where the first mariachi festival was held in 1979. Since then, a strong synergy between academic programs and mariachi festivals has developed, which feature students and give mariachi classes and workshops. Once school programs were limited to border areas such as San Antonio and Tucson but they have spread across the southwest and into other parts of the country, especially since the 1990s. There are at least 500 schools offering classes along with local and state competitions. In some US schools, mariachi ensembles have replaced school bands. Professional groups such as Mariachi Cobre, which regularly performs at Disney World, also spend time teaching in public schools. The Mariachi Divas de Cindy Shea is an all-female Mariachi based in Los Angeles, California, founded in 1999 by Cindy Shea. In 2009, they became the first all-female Mariachi nominated for a Grammy Award, and the first to win one. As of 2014, the Mariachi has been nominated for five Grammy awards, winning twice. They are the official Mariachi of the Disneyland resort. In areas with large Mexican-American populations, mariachis are being hired for events outside this ethnic group as well. Outside of schools, the most important venue for the music in the United States is mariachi festivals with the longest running festivals in Tucson and Fresno. The Tucson International Mariachi Conference began in 1982. It originally was held in the downtown but in 2012 moved to the Casino Del Sol. It showcases over 500 elementary, middle, and high schools and college mariachi players. The Las Vegas International Mariachi Festival, established in 1991, is televised on Telemundo and PBS and has headlined artists such as Pedro Fernández, Ana Gabriel, and American born mariachi singer Pepe Aguilar and more. 8 time. Much of the published mariachi music is meant for people already familiar with the music to serve as guides, not to novices. On the other hand, many schools have problems recruiting mariachi instructors as many of these do not have required teaching credentials. For this reason, schools often hire trained musicians from outside the mariachi tradition. Many traditional mariachis are concerned that standardization will lead to the genre becoming rule-bound and so restrict improvisation. Other innovations in the United States have been the incorporation of styles of artists such as Elvis Presley, Freddy Fender and Glenn Miller, as well as the heavy-metal Mariachi band Metalachi. Another is the encouragement of female mariachis including all-female Mariachi groups such as Mariachi Mujer 2000 and Mariachi Divas de Cindy Shea. Mariachi Mujer has performed with Mexican artists such as Vikki Carr, Pablo Montero, Gerardito Fernandez and Nydia Rojas. Mariachi Divas have won 2 Grammy Awards, have toured extensively in the United States and are the official Mariachi of Disneyland Resort in Anaheim. New York's first international all-female mariachi is 2015 Latin Grammy nominated Mariachi Flor de Toloache, who are featured in Dan Auerbach's The Arcs. There is an all-female Mariachi in London, UK, Mariachi Las Adelitas UK, who plays traditional Mexican Mariachi music as well as some English-language covers in Mariachi style. The most common dance technique in mariachi is zapateado, a kind of footwork from Spain. Pounding of feet into a raised platform often provides the percussive. Jose Hernandez (Ambassador of Mariachi Music) and Mariachi Sol de Mexico. ^ a b "UNESCO Reconoce al mariachi como patrimonio de la humanidad" [UNESCO recognizes mariachi as a world heritage] (in Spanish). Mexico: INAH. November 27, 2011. Retrieved June 20, 2012. ^ a b c d e f g h i j k "History of the Mariachi Puro Mariachi Foundation". Puro Mariachi. Retrieved June 20, 2012. ^ a b c d e f "What is Mariachi Music?". New Mexico State University. Retrieved June 20, 2012. ^ a b c d e f g h i j Camille Collins (March 9, 2007). "What is the mariachi?". Mexconnect newsletter. ISSN 1028-9089. Retrieved June 20, 2012. ^ Clark, Sylvia (2005). ""Mariachi music as a symbol of Mexican culture in the United States"". International Journal of Music Education. 23: 227–237 – via SAGE. ^ Greathouse, Patricia. Mariachi. Layton: Gibbs Smith. 2009. p. 35. ^ a b c d Cecilia Martinez-Avila (November 1997). "Marvelous Mariachi: A new generation embraces centuries-old music of Mexico". Hispanic. Denver: 28. ^ a b Jáuregui, Jesús. 2007. El Mariachi: Símbolo Musical de México. México D.F. : Instituto Nacional de Antropología e Historia. ^ Chavez, Humberto Dominguez. "Programa de Cómputo para la Enseñanza: Cultura y Vida Cotidiana: 1900-1920, Historia de México II Primera Unidad: Crisis del Porfiriato y México Revolucionario 1900-1920, La música y el teatro popular de 1900 a 1920". Universidad Nacional Autónoma de México. Retrieved September 9, 2015. ^ Castillo, Manuel M. (2014). "Italian and Spanish Influence on Selected Works of Mexican Composers: María Grever, Ignacio Fernández Esperón "Tata Nacho," and Augustín Lara". The UNiversity of Kentucky UKnowledge, Thesis and Dissertations, Music. The University of Kentucky: 20. Retrieved September 8, 2015. ^ a b [Méndez Rodríguez], Hermes Rafael. 1983. Los Primeros Mariachis en la Ciudad de México. Guía Para el Investigador. México D.F. : S.E. Pesadilla de Fondo. ^ a b Chris Hawley (July 16, 2010). "Mexico protects its mariachi plaza". New York. Retrieved June 20, 2012. ^ Henriques, Donald A. 2006. "Performing Nationalism: Mariachi, Media and the Transformation of a Tradition (1920-1942)." Ph.D. dissertation, University of Texas, Austin. ^ a b c d Donald Andrew Henriques (2006). Performing nationalism: Mariachi, media and transformation of a tradition (1920--1942) (PhD). The University of Texas at Austin. OCLC 3294414. ^ a b c Sheehy, Daniel. 2006. Mariachi Music in America: Experiencing Music, Expressing Culture. New York: Oxford University Press. ^ a b "Mariachi: The Spirit of Mexico WLIW New York". WLIW. New York. May 4, 2012. Archived from the original on July 29, 2012. Retrieved June 20, 2012. ^ a b c d e Guy Keeler (March 23, 2006). "Girls get the beat: Mariachi's male image doesn't faze young women". McClatchy - Tribune Business News. Washington. p. 1. ^ Martha Sarabia (May 10, 2008). "Mariachi de a millón" [Mariachi of a million]. La Opinión (in Spanish). Los Angeles. ^ "The world's best mariachis - El Mariachi Vargas de Tecalitlán". La Voz Bilingüe. Denver. October 1, 2003. p. 8B. ^ Clark, Jonathan. 1994. "Introduction." Cuarteto Coculense: The Very First Recordings 1908-1909 (Sones Abajeños), produced by Chris Strachwitz. El Cerrito: Arhoolie Records, CD7036. ^ "Mariachi Groups From Around the World Gather in Mexico". New York. August 29, 2011. Archived from the original on October 4, 2011. Retrieved June 20, 2012. ^ a b Sevil Omer (May 4, 2012). "'Mariachi has changed my life': Mexican music grabs US students". MSNBC. New York. Archived from the original on May 8, 2012. Retrieved June 20, 2012. ^ Gradante, William and Daniel Sheehy. 2008. Foundations of Mariachi Education, Vol.1: Materials, Methods, and Resource. Lanham, MD: Rowman & Littlefield Education. ^ "LA Holiday Celebration: Mariachi Divas de Cindy Shea". LA County Arts Commission. 2010. Retrieved June 27, 2014. ^ Richard Irwin (January 23, 2014). "Mariachi Divas de Cindy Shea get fifth Grammy nomination". San Gabriel Valley Tribune. Retrieved June 27, 2014. ^ Salazar, Lauryn C. 2011. "From fiesta to festival. Mariachi music in California and the Southwestern United States." Ph.D. dissertation, University of California, Los Angeles. ^ Caitlin Harrington (April 24, 2012). "Tucson International Mariachi Conference Celebrates 30th Year". Tucson. Retrieved June 20, 2012. ^ "About Us". Las Vegas International Mariachi Festival. Retrieved June 20, 2012. ^ Urrutia de Vázquez, Cristina. 1984. Origen y Evolución del Mariachi. Guadalajara: Sociedad de Amigos de Museo Regional de Guadalajara. ^ Yee, Vivian. "An All-Female Band, Making Its Way in the World of Mariachi". City Room. Retrieved 2016-03-06. ^ "Mariachi Flor de Toloache". Latin GRAMMYs. Retrieved 2016-03-06. ^ "Approval Matrix". New York magazine. June 17, 2013. Wikimedia Commons has media related to Mariachi.